On arrival at Cochin - the queen of Arabian Sea. Meet and greet at the airport transfer to the hotel and overnight stay at the hotel. Morning proceed to sight seeing visiting - ‘The Jewish Synagogue’ at the heart of what is locally called the Jew Town, ‘The St. Francis Church’, the oldest European Church in India, The Dutch Palace, Spice market at the narrow streets and the ‘Chinese fishing nets’ are huge cantilevered fishing nets believed to have brought to Kochi by Chinese traders. Return to hotel for lunch and later in the evening visit the famous dance drama of Kerala, the “Kathakali”. Overnight at the Hotel. 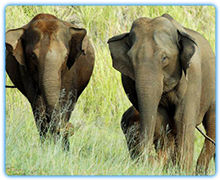 After breakfast checkout and drive to Periyar one of the well-known wildlife sanctuaries of South India is famous for wild animals especially elephants. The splendid artificial lake formed by the Mullaiperiyar dam across the Periyar River adds to the charm of the park. This is the only sanctuary in India where you can have the unique experience of viewing wildlife at close quarters from the safety of a boat on the lake. On arrival check into hotel. Overnight at the hotel. Morning proceed for boat ride later visit spice plantations like cardamom, cinnamon, pepper, coffee, tea estates etc. on your way back to the hotel, you could stop at the local market and pick up some fragrant spices. Overnight at hotel. Breakfast at the hotel and later drive to Alleppey - Known as the Venice of the East. On arrival check into a traditional House Boat of Kerala Style. 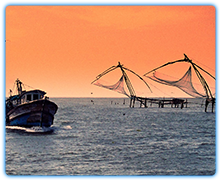 Cruise through the backwaters is the fabulous way to explore the fascinating beauty of the backwaters. (Overnight at Houseboat). After breakfast disembark from the boat jetty and drive to Kovalam and checks in at beach resort. Rest of the day to relax at the beach. or indulge in Ayurvedic massages. Kovalam is a sheltered bay endowed with unusual beauty, located on the magnificent Arabian Sea coast. This natural bay is a safe sea-pool, free from high waves and surges. It is an ideal place to swim, sunbathe and perhaps enjoy the ancient rites of an Ayurvedic massage and oil bath. Overnight at the hotel. Daily breakfast at the beach resort. Days are free for relax at beach side Or chose the various Ayurveda treatments are available at the resort. to avail of the benefits of Ayurveda, one does not need to be ill...it is a wonderful way of life which promotes health, de-stressing and general well-being. Breakfast at the hotel, later drive to Trivandrum airport for onward flight.